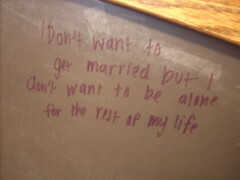 I don't know what's sadder about this: the fact that someone young enough to be in college is so worried about loneliness, or the fact that she was worried enough to write it on a bathroom wall. Marriage has been in the air these days, although it might be more appropriate to say weddings are in full bloom. Even without the social crutch that is Facebook I can tell that so many of my peers and classmates are getting hitched. Don't get me wrong: I love weddings and am all for stopping to celebrate healthy, long-lasting relationships. I hope to marry someday too, but for reasons different than the ones captured here. But there was something about this particular piece of accidental poetry that pinned down my internal skeptic when it comes to marrying young. "I don't want to get married but I don't want to be alone for the rest of my life." I wonder who she meant to read this, who she might consider marrying, and how soon she thinks she should settle. More than anything, I wonder if a few years from now, she'll find herself in a different place, maybe with a different partner, realizing that whatever race she thinks she's losing is not really a race at all.